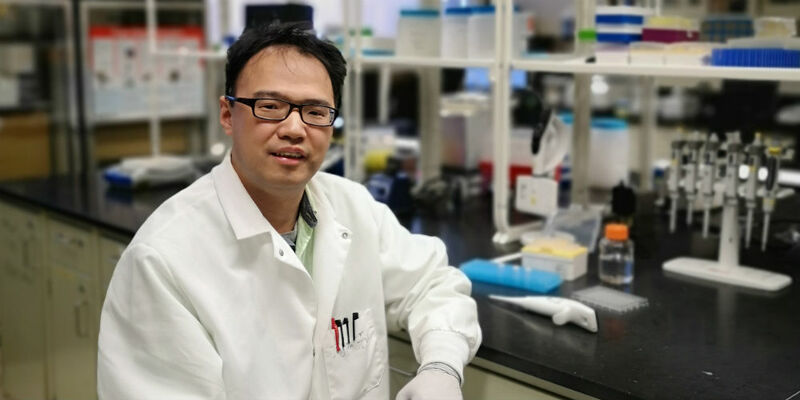 Jinglin Fu, an associate professor of chemistry at Rutgers University–Camden, has received a $1 million Early-Career Award for Scientists and Engineers (ECASE-Army) from the Army Research Office. The five-year award recognizes researchers who pursue innovative science and technology discovery and engage in scientific leadership, education, or community outreach. “This is an important award to support my lab’s research of biomimetic systems as well as exploring new directions in biomolecular assemblies and functions,” says Fu, who is also a member of the Rutgers‒Camden Center for Computational and Integrative Biology (CCIB). His research will aid the development of adaptable platforms on which biocatalysis, biofuel production, and biosensor devices can be integrated, activated, and regulated. One of the applications of the technology could be potentially applied to engineer smart biosensors for molecular diagnosis and point-of-care tests. “In line with Army goals, this will harness new capabilities to enhance warfighter protection and performance,” Fu says. The ECASE‒Army award funds a graduate student and a postdoctoral student to conduct research in Fu’s lab, and provides paid summer research internships for undergraduate students on the Rutgers‒Camden campus. ECASE awards are the highest honor bestowed by the Army Research Office to outstanding scientists and engineers beginning their independent careers. A resident of Cherry Hill, Fu will present his research at an Army Research Office symposium in 2020. Fu earned a Ph.D. in chemistry from Arizona State University in 2010. He earned a master in analytical chemistry degree in 2006 and a bachelor’s degree in chemistry in 2003 from Zhejiang University in China.